About me About the blog Topics Success Want to help? My name is Bartlomiej Filipek (or Bartek as a shorter version), @fenbf. I am a software developer from a beautiful city Cracow in Southern Poland. This is my coding blog. I started coding when I was 14 years old (first book "C++ in 24h"! :)), I got my first real programming job in 2007. Since that moment I gained professional experience in quite a lot of different areas: Native Windows Desktop Apps, OpenGL, Gamedev, BioFeedback games, .NET, Large scale app development, flight planning, and even some graphics driver coding (see my experience on linkedin). During studies I also tried to teach other people by creating lectures about OpenGL and gamedev. Currently I work as a C++ software developer for Xara. My code can be found in advanced document editors from the company, mainly in Text area. The team is distributed all over Europe and I work remotely from Cracow. Recently I also wrote my first book! Since October 2018 I got my first MVP title! In April 2018 I got a pleasure to be a guest at CppCast. Please watch this episode where I spoke about my blogging schedule, my first book, text formatting and advanced algorithms that we use at Xara, Cracow C++ Group... and more. I am happy to answer questions about my posts, talk about possible collaboration or just exchange ideas. I like creating training materials and I like teaching. This place gives me a chance to experiment with new technologies. My work is visible so I have more motivation to finish projects. You can expect a few posts per month: on Mondays (every Monday if possible). Unauthorized use and/or duplication of this material without express and written permission from this site’s author and/or owner is strictly prohibited. Excerpts and links may be used, provided that full and clear credit is given to Bartlomiej Filipek with appropriate and specific direction to the original content. Briefly: If you want to republish some of my articles on other site let me know first. If you have ideas about posts you'd like to read, please let me know! C++ Status at the end of 2015 - won Best C++ Article of January 2016 (First Prize) @codeproject! 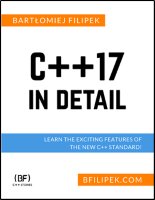 Top 5 Beautiful C++ std Algorithms Examples - won Best C++ Article of December 2014 (First Prize) @codeproject! Learning Modern OpenGL - won Best C++ Article of May 2014 (Second Prize) @codeproject! Share my articles on your social media accounts. Comment under the posts and on reddit/heckernews. Give me feedback about the content quality, language, typos, etc. Do you like what I do? Signup to my newsletter for more.